FearFest is now in its 15th year of terror and features 4 amazing attractions at one location! Hawthorn State Asylum and The Mortuary (Haunted houses), Terror in the Woods (Haunted trail) and Zombie Safari Paintball (Shoot zombies while riding on our custom trailers!). 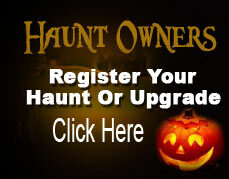 Also new this year is the ability to customize your scare level! Both more intense and less intense options are available! Fear Fest Haunted House is located at 6399 US-40, Columbia, MO 65202, 3 miles West of Columbia Missouri off I-70 at exit 121. Go right, we are just down the road 1/4 mile on the right.